For Episode 105, we landed an interview with James Araujo of the Mixed In Key marketing team. As the product that has been the leader of the key detection and harmonic mixing game in the digital DJ world, we are honored that they took some time to help explain not just what Mixed In Key is, but how their software is another tool we DJs can use to create better sets. For those who are not familiar, Mixed In Key is the flagship product for the Mixed In Key company, started by Yakov Vorobyev. In short, the software analyzes your music library, and then properly tags the music with the key the track was written in. Note: The creators of Mixed in Key have written a book called Beyond Beatmatching: Take your DJ Career to the Next Level, which you can read online for free. 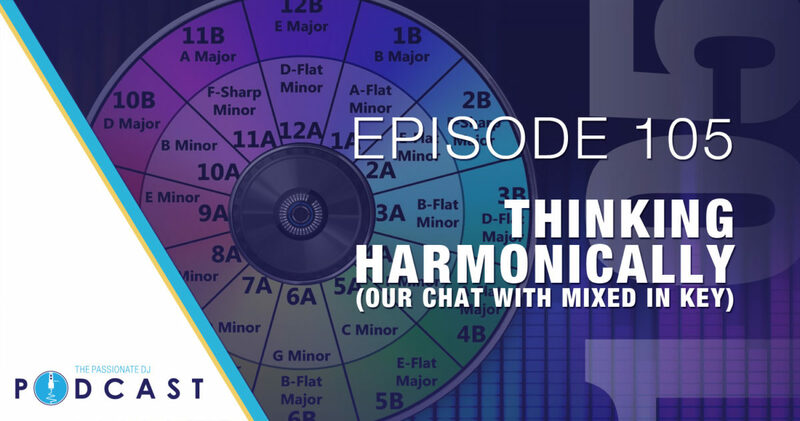 This allows us, as DJs, to use a mixing technique called Harmonic Mixing, which is where you mix tracks together that fall in the same musical scale. Mixed in Key facilitates this by either tagging the track with the traditional key notation and the scale (C Maj, A# Min, etc) or with the numeric system (1A, 3B, etc). Both of these notations can then be used with the Camelot Wheel, which allows us to take advantage of a music theory concept called “The Circle of Fifths”, very easily. Is this necessary? No, of course not. Thousands upon thousands of DJs have been very successful without ever learning a lick of music theory. However, if it’s a tool you can learn that would allow you to be more flexible and do some new things, then there’s certainly no harm in it! Mixed In Key also has other features, such as batch ID3 tag processing, energy level detection, and it will even automatically place cue points to use with Traktor, Serato, and other digital DJ software. Mixed In Key also provides other tools for DJs and producers to use, as well! Visit Mixed In Key to purchase! And make sure to check out the free eBook: Beyond Beatmatching.